The attitudes of those who work in human service fields are critical to the outcomes of the people they serve. Research suggests that factors such as overwork, poor interpersonal relationships with colleagues, dissatisfaction with pay, lack of employee involvement in decision making, and low levels of support from management contribute to negative workplace attitudes and lead to high turnover (Leider, Harper, Shon, Sellers, and Castrucci, 2016; Reynolds, 2007). In early childhood education, relationships between teachers and children are affected when teachers experience workplace stress (Cassidy, King, Wang, Lower, & Kintner-Duffy, 2016; Whitaker, Dearth- Wesley, and Gooze, 2014; Zinsser and Curby, 2014). The Center for the Study of Child Care Employment found that insufficient teaching supports and inadequate compensation lead to poor program quality and high turnover (Whitebook, King, Philipp, and Sakai, 2016). To better understand the conditions that affect attitudes about the workplace, the McCormick Center for Early Childhood Leadership at National Louis University examined data from child care center staff and administrators who completed the Early Childhood Work Environment Survey (ECWES) (Bloom, 2016). While attitudes about the early childhood workplace were mostly positive, negative work attitudes differed by the employee’s role, program type, and program size. An existing dataset of 2,652 child care center staff and administrators, who completed the ECWES online survey between August 2015 and March 2017, was examined. Participants represented 197 programs from 15 states or Canadian provinces. Their highest level of education was well distributed: 20% high school or GED, 32% some college, 18% associate degree, 20% baccalaureate degree, 3% some graduate studies, 6% graduate degree, and 1% post-graduate studies or doctoral degree. On average, participants worked in the field of early childhood education for 11 years; were with their current employer for five years; and served in their current position for four years. 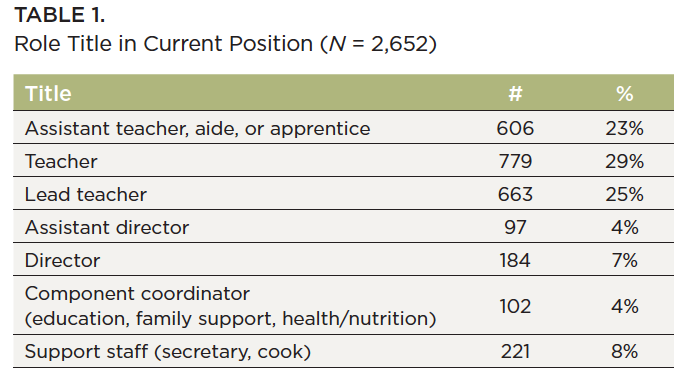 At the time of completing the survey, participants worked in a number of roles as indicated in Table 1. There was also a distribution of program types where the participants were employed. Figure 1 shows the various types of programs represented in the sample. Eighty percent of the programs served infants, 93% served toddlers, 97% served preschoolers, and 61% of the programs served school-aged children. The average enrollment was 115 (SD = 89) and the average licensed capacity was 146 (SD = 124). The ECWES is a reliable and valid instrument that measures multiple aspects of the workplace environment including work attitudes, ideal perceptions and expectations about the workplace, and ten dimensions of organizational climate. One domain—work attitudes—was selected for this analysis. It assesses perceptions about the organization by selecting from ten descriptors (five positive and five negative) of how the employee feels about the organization. Frequencies were compared to characteristics of the participants and their programs using one-way ANOVA to determine whether factors could predict work attitudes. Analysis of the survey responses revealed that overall, child care employees were more positive than negative in their attitudes about their workplace. Nearly two-thirds of the respondents put extra effort into their work, took pride in their center, and were very committed to working there. About half of the respondents plan to work at their current place of employment for the next two years or more. However, only 25% of the respondents felt it would be difficult to find a job as good as the one where they were currently working. Additionally, about 15% of the respondents often thought of quitting. Less than 10% of child care employees felt trapped in their jobs, struggled with being committed to their center, felt they were just putting in time, or would not care about the center if they left. Table 2 shows the frequency and percent of responses about work attitudes. Responses were analyzed to determine if there were differences in work attitudes by the characteristics of respondents or by the characteristics of the child care centers where they worked. No differences in attitudes about work were found based on gender or highest level of education. 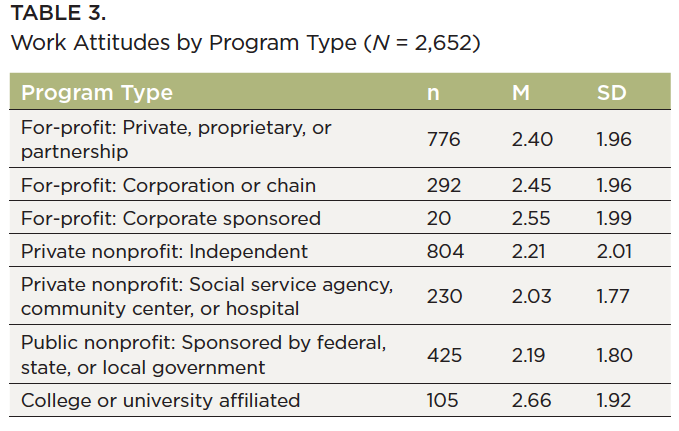 Differences were found for respondents based on their roles, by program type, or by program enrollment. There was a statistically significant difference between respondents based on their role as determined by one-way ANOVA, F (10, 2641) = 3.052, p = .001, η2 = .011. A Tukey post hoc test revealed that work attitudes among directors and assistant directors were more positive than staff in other roles. However, the magnitude of these differences was small. Significant differences were also found, using one-way ANOVA, among the types of programs where respondents worked F (10, 2641) = 2.603, p = .004, η2 = .001. The effect size of these differences is very small and should be considered when understanding the magnitude of this finding. Table 3 shows the means and standard deviations for the different types of programs. Mean scores are computed by averaging the number of Work Attitude Responses, ranging from -5.0 (five negative work attitudes selected) to 5.0 (five positive work attitudes selected). A statistically significant difference was also found between groups based on the size of program enrollment when a one-way ANOVA was performed, F (2, 2645) = 20.37, p = .000, η2 = .015. Program size was grouped as small (1-69), medium (70-139), and large (140+). A Tukey post hoc test revealed that work attitudes among staff in large programs (m=1.90, sd= 1.95) were rated lower than those of small (m=2.52, sd= 1.85) and medium (m=2.39, sd= 1.94) sized programs. Findings from this study suggest that a majority of child care center staff have positive work attitudes and plan to continue working at their current place of employment. However, there is a small portion of employees who have serious negative attitudes including feeling trapped in their jobs, lack of commitment to the center, or are “just putting in their time.” The finding that 15% of child care workers frequently think about quitting their jobs is consistent with high turnover in early childhood education. Early childhood program leaders should work to identify negative attitudes in the workplace, because of their effects on the quality of care and education, including interactions with children. Differences in work attitudes between administrators and staff serving in other roles suggest a need for examination of attitudes among teaching and support staff. Less positive work attitudes among staff in the non-profit sector indicate that additional research is needed to understand what specific factors contribute to this disparity. Furthermore, this study identifies the potential challenge of maintaining positive work attitudes in larger centers. However, the small magnitude of effects in these group comparisons indicate that further study is advised to confirm group differences. Bloom, P. J. (2016). Measuring work attitudes in early childhood settings: Technical manual for the Early Childhood Job Satisfaction Survey (ECJSS) and the Early Childhood Work Environment Survey (ECWES) (3rd ed.). Lake Forest, IL: New Horizons. Reynolds, J. J. (2007). Negativity in the workplace. American Journal of Nursing, 107(3), 72D. Whitaker, R. C., Dearth-Wesley, T., Gooze, R. A. (2014). Workplace stress and the quality of teacher-children relationships in Head Start. Early Childhood Research Quarterly 30(2015), 57-69. Whitebook, M., King, E., Philipp, G., & Sakai, L. (2016). Teachers’ Voices: Work Environment Conditions That Impact Teacher Practice and Program Quality. Berkeley, CA: Center for the Study of Child Care Employment, University of California, Berkeley. Woestman, D. S., & Wasonga, T. A. (2015). Destructive leadership behaviors and workplace attitudes in schools. NASSP Bulletin, 99(2), 147-163. Üstün, A. (2017). Effects of the leadership roles of administrators who work at special education schools upon organizational climate. Universal Journal of Educational Research, 5(3), 504- 509. Zinsser, K. M., & Curby, T. W. (2014). Understanding preschool teachers’ emotional support as a function of center climate. Sage. DOI: 10.1177/2158244014560728.